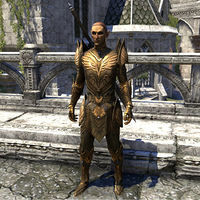 This template creates an infobox for use on all Elder Scrolls Online NPC and creature pages. It includes the appropriate bread crumb trails and categories. titlename optional NPC's name as displayed at the top of the infobox. Generally NOT needed; will default to use PAGENAME. Only needed when pagename contains extra information (i.e., disambiguation). title optional The NPC's title, if any. Defaults to the same as the sells parameter, if available. notrail optional If set to "yes", the breadcrumb trail normally created by the template is suppressed (for cases where multiple templates are used on one page or when used for a generic NPC. width optional Width to use for the table. Default value is 33%. This parameter only needs to be set in cases when the default value needs to be altered, for example when putting the infobox inside a table for better layout. image required The name of an image file for this NPC, just the file name. If this parameter is missing, a NeedsImage banner will automatically be added to the quest article. In cases where an image is truly never needed, set image to "none". imgdesc see note Description of image (only needed if image is provided). follower optional Is NPC a follower? creature optional Changes the categorization and image checks to creature specific information. Also changes the displayed Race parameter to Species. Put the creature's species in the race parameter. generic see note Required if NPC is generic. city optional NPC's "Home City". Separate multiple cities with a comma only. Do not use any other punctuation or a space. If entered as plain text, each city will be formatted as a link to appropriate page. For special cases, use a full link. settlement optional NPC's "Home Settlement". Separate multiple settlements with a comma only. Do not use any other punctuation or a space. If entered as plain text, each settlement will be formatted as a link to appropriate page. For special cases, use a full link. loc optional "Location" where NPC can be found (if NPC does not live in a city or settlement). house optional "House" where NPC can be found (if NPC owns the house). store optional "Store" where NPC can be found (if NPC is a merchant). race see note Race. If racecat is _not_ provided Race should be a plain word, i.e., not a link. If racecat is provided, race can be a plain word or a link to the appropriate race page. racecat optional Race to be used for page's race category: not as a link, singular. Generally NOT needed: will default to use race. Only needed when using a non-standard race that does not have a category. Can be set to blank to not categorize by race. gender required Male or Female. Use "Varies" if either gender is possible. Do not use if the creature parameter is used. health optional NPC's health. Required if reaction is anything except Friendly. If health is set at 0, the NPC will be categorized under [Category:Online-Dead NPCs] and the reaction parameter will be hidden. difficulty optional The NPC's difficulty level, depending on the number of pips on their health bar. faction optional Factions to which NPC belongs. soul deprecated If a creature, this is the level of soul. Replaces gender for creatures. reaction required The behavior of the NPC (Hostile, Neutral, Justice Neutral, Friendly). pickpocket optional Pickpocket difficulty (only for Justice Neutral NPCs). loottype optional Profession of the NPC, indicating what type of loot they carry. class optional Combat class this NPC has. drops optional Any items carried by creature (or added to their corpse on death). sells optional Type of merchant. sells2 optional Second type of merchant. This page was last modified on 7 April 2019, at 18:03.